Save BHD 0 (0%) Earn 71 Shukrans What is Shukran? Shukran is the Landmark Group’s award-winning loyalty programme in the Middle East, which allows you to earn Shukrans when you shop any of our brands. 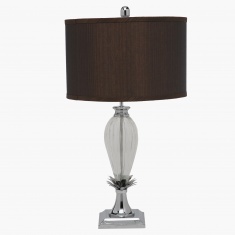 Stunning and classy, this table lamp is sure to uplift the look of your home. Featuring a classic styling, this piece has a glass stand and fabric shade that are both durable.